In effect, there is not much of it on shelf, and that’s probably why a lot of us are not entirely sure which books fall under this category and where we can find them. #HeistClub is out to solve this mystery. 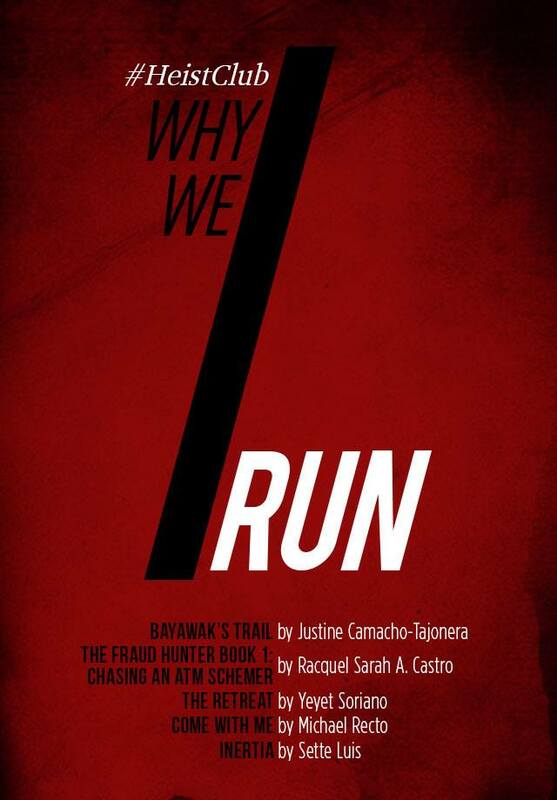 For Part 1, authors Justine Camacho-Tajonera, Racquel Sarah A. Castro, Yeyet Soriano, Michael Recto and Sette Luis of Why We Run are here to talk about choosing crime fiction, killing off characters and believing in a #readingnation. Tell us more about #HeistClub. How did it come about and why crime fiction? Justine: #HeistClub was a workshop that Mina V. Esguerra initiated last year in October. She pulled together some resource persons like journalist and crime author, F.H. Batacan and forensic anthropologist, R.J. Taduran. Michael: It was was a month-long writing workshop, with the aim to produce Filipino authored crime stories for both the local and international audience. Yeyet: There were very specific instructions. The story to be written needed to be Case #1, meaning it had to be first in a series. It should also be in English and set in the Philippines. I believe Mina saw the need to explore other genres, and crime fiction was an untapped genre—at least, in the Philippine setting. She saw the potential of Filipino crime fiction here and abroad, which had us looking long-term and international, with the end result of publishing our crime stories on Kindle version and distribute it through Amazon. Racquel: I always watch television and notice that half of it is crime. So, why not write about it? Writing about cyber crimes [and how to deal with them] may also be an advocacy because of my profession as a programmer. Justine: I wanted to stretch my self as a writer. I have never written crime before, but I love reading crime and mystery books like the ones by Gillian Flynn and Stieg Larsson. When I read Smaller and Smaller Circles by F.H. Batacan, I was blown away. I wanted to try my hand at something new, and I also saw it as an opportunity to make crime something Filipino. I was struck by what Batacan said in an interview about serial killers possibly existing in the Philippines, [only that] we’ve just never had the institutions and processes in place to investigate them. Yeyet: As a child, I adored Nancy Drew and I wanted to BE her. [So growing up], I wanted to be a detective, then a lawyer! I love solving mysteries! I had it in me to thrive in this genre. My imagination runs into the darker side, so I had no issues writing. I also love the psychology of crime: understanding the motivations and the reasons people become criminals, the psychological wounds experienced by victims, the psychological effects on everyone else around them. Michael: My writing career is still at its infancy, so I’m at that point where I’m still exploring genres. So far, I’ve written children’s stories, poems and fantasy short stories. Crime fiction seemed like a good genre to play around in, so I took the plunge. Was it easy or difficult to write in this genre? Racquel: As a romance writer, it was hard for me to write crime, but I have learned to like the challenge. It also made me realize that as authors, we have a responsibility to give back to society by writing to inform and warn. Justine: It was definitely hard for me to write crime! I’m used to doing research for my books but crime is a whole new ballgame. Knowing more about police procedure and forensics was quite overwhelming for me. On top of that, I also had to do a lot of research on the topic that I chose: the Lumad. I spent more time reading about the Manobos (or the Manuvus) than I did writing the story! Yeyet: I found it surprisingly easier to write in this genre than to do a full-out contemporary romance, and again, that is because of my tendency to go “dark.” I enjoyed that there are no constraints in this genre, and that I didn’t have to write towards a pre-destined happy ending. I can go wherever the story goes and end it the way it needs to end. Michael: Writing fiction has always been a difficult undertaking, and I felt that the difficulty level was taken several notches up with crime fiction. We all do our best to live peaceful lives so to delve into the dark world of crime, even if it was just fictional, was both an enlightening and harrowing experience. Here in the Philippines, crime fiction seems to be most widely depicted on television dramas and movies. How do you think is crime fiction in print form faring among Filipino readers? Justine: I hardly see any Filipino crime fiction in print. I don’t think it’s for a lack of interest; there’s just a lack of writers who are interested in writing Filipino crime fiction in general. Or maybe there’s a lack of interest from the publisher side, which I understand, because publishing is a gamble. However, this is good for indie authors. We have a lot of room to explore this genre. Yeyet: There are a smattering of Filipino crime/mystery TV series or movies, but you are right, hardly any on print. I was surprised when we were given Smaller and Smaller Circles by F.H. Batacan to read as assignment in #HeistClub. I didn’t know we had such kinds of stories written by Filipinos. I loved it and was an instant fan. That is why we are excited to introduce a new generation of writers and stories and hope we do tap and find the readers that love this genre. Michael: What I know is that locally, there is a huge following for mystery stories in Wattpad so I’m confident that crime fiction stories do have a market in the country, especially among the youth. Justine: It’s a genre that keeps the mind alert and sharp! Who doesn’t love a whodunit and a cliffhanger, right? Also, I think there’s a lot of material just waiting to be written. We shouldn’t leave it up to other countries to give us crime fiction. Yeyet: There is the fact that a lot of people love mysteries, so why not write Filipino mysteries and crime stories right? We have a lot of real-life crime and mysteries to write about, making it both a learning and an entertaining experience for the readers. Michael: Crime fiction, just like any work of art, is a reflection of life. It’s meant to not only entertain us, but to remind us that we should always look for each other’s welfare, to be vigilant for each other’s safety and to be responsible for everyone’s peace of mind. Crime fiction does not only focus on the perennial “good vs. evil” trope but it also focuses on the emotions of those who experienced, witnessed and mitigated crimes. Michael: We’ve always been a strong reading nation. If we weren’t, we wouldn’t have produced great authors like Nick Joaquin, Lualhati Bautista, F. Sionil Jose and F.H. Batacan (yes, I put her up there with the great ones). Couple that with our love for social media and we’ve produced talented pop fiction authors like Marcelo Santos III, Denny R. and Bob Ong. Racquel: Indeed, there are a lot of Filipino bookworms I know. Among my friends, almost 80% of them read. Justine: We do have a reading population. It’s just a matter of capturing their imagination and exciting them with new material. Yeyet: I believe Filipinos will read good quality stories as long as we are able to tap their interest. The problem though is making them aware that all these stories are available for them to read. Justine: If crime, definitely Smaller and Smaller Circles. Books by Gillian Flynn and Stieg Larsson are also in my list. Yeyet: Anything by Stephen King, who incidentally came out with his own crime series, Mr. Mercedes and Finders Keepers—a few more inspirations for me. Same with Robert Gailbraith/J.K. Rowling. Michael: Smaller and Smaller Circles is definitely up there. Even if it wasn’t a required material for #HeistClub, I would have gladly picked it up and read it. Prior to that, I was reading Dan Brown books, particularly Angels and Demons and The Lost Symbol. I also finished a Harlan Coben audiobook recently, titled Fool Me Once. Yeyet: Not any one author, really, because I read a lot. F.H. Batacan, Stephen King, Robert Galbraith/J.K. Rowling, Clive Barker, Anne Rice and Neil Gaiman, among others. Sette: Mina because she writes in an effortless manner. F.H. Batacan and Neil Gaiman are awesome as well. Michael: Definitely F.H. Batacan. If it weren’t for her, I wouldn’t have been inspired at all to write crime fiction. Harlan Coben comes in a close second. Any favorite reading-related quote you want to share?